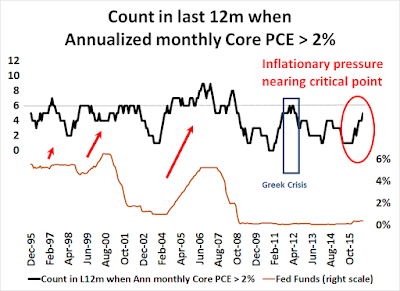 Fedwatch: How much high a pressure can the economy handle? Ever since Janet Yellen made that her "high pressured economy" speech, market analysts have been scrambling to understand what she meant by that term. The Fed Chair used that term in the context of a research conference held at the Boston Fed. So was it an academic musing, or was it a hint of a subtle shift in Fed policy? 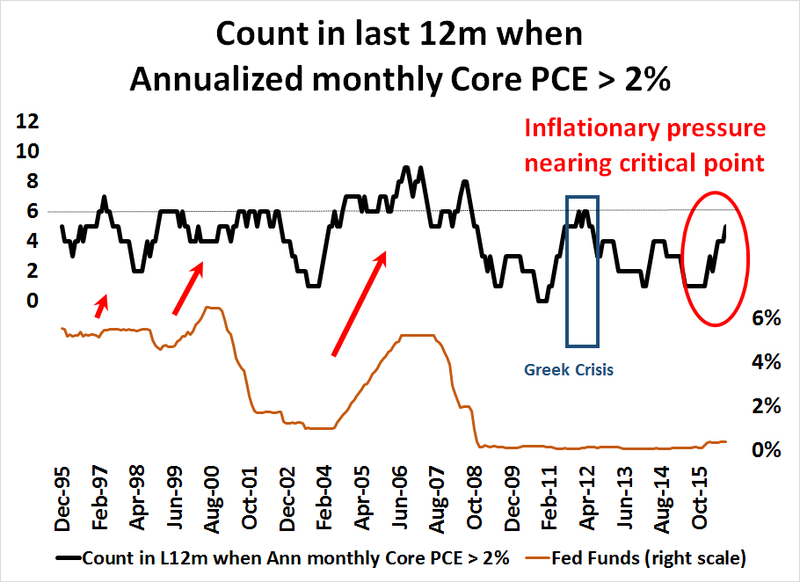 The chart below shows the number of instances in the last 12 months when Core PCE has exceeded 2%, which is the Fed's inflation target. As the chart shows, the FOMC has tended to start a tightening cycle whenever the rolling count has hit six. The only exception occurred in 2011, when Europe mired in a Greek debt crisis. The latest September Core PCE reading, which was released today, came in an annualized 1.7%, which was short of the 2% target. With the current count at five and therefore nearing the threshold for a tightening cycle, the question of the degree of tolerance for higher pressure in an economy is an important issue for monetary policy. FBI email probe + rising rates = Equity bear? Up until Friday, the big story of last week was the bond market's shellacking in the face of rising inflationary expectations. I had been planning to discuss whether the rout in bonds is likely to take down stock prices. Then the news hit the tape that the FBI was investigation new Clinton emails that were discovered in the course of the Anthony Weiner sexting investigation. Stock prices, which were up modestly, tanked on the news. 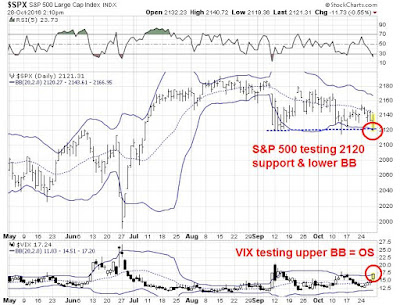 At the height of the sell-off, the SPX fell and tested the key support level at 2120, and the market flashed oversold warnings on selected indicators. 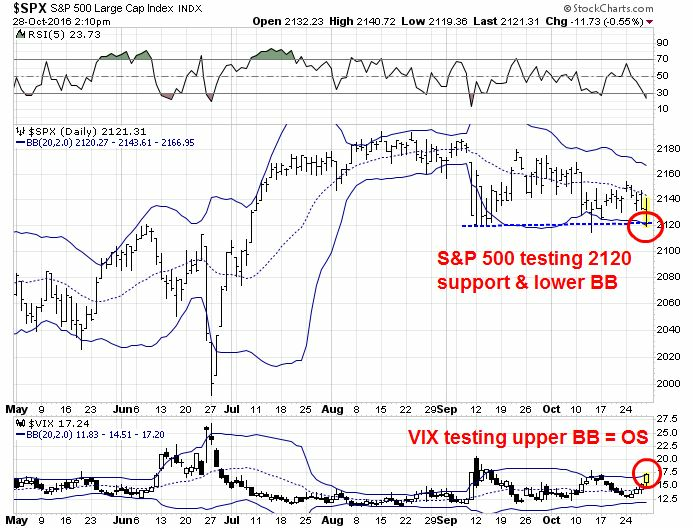 By the close, the bears were unable to gain the upper hand and 2120 support held. As the market has been trading sideways since the upside breakout in July, the question is whether this news is enough to signal the start of a bear phase (see my last post The bulls and bears wait for Godot). 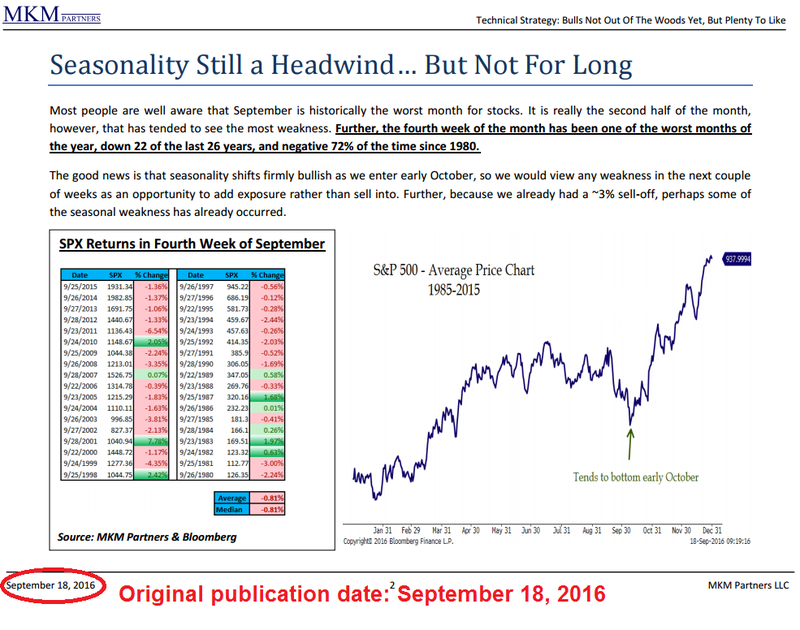 The bulls had been unable to push stock prices to new highs despite the emergence of renewed growth (see Q3 earnings season: Stud or dud? ), can the bears take advantage of the news of a new FBI probe of Hillary Clinton`s email to weaken stock prices? I begin this week's market analysis with an examination of the stock market's macro and fundamental backdrop. and then consider the ramifications of Friday's political bombshell. 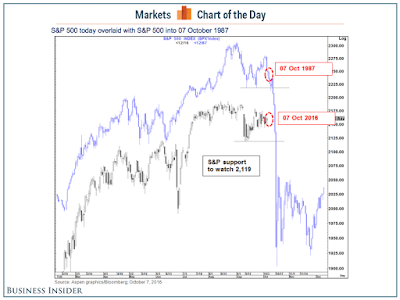 Mid-week market update: Several readers wrote me this week with similar comments, which went something like, "I concur with your bullish fundamental reasoning, but the stock market is trading little 'heavy' and I am concerned." I agree 100%. Despite the bullish fundamental and technical tailwinds (see Six reasons why I am still bullish), the market hasn't been able to break out of the narrow range since the upside breakout in July to new all-time highs. What has happened the past four months is truly historic, in that nothing has happened. For equities to trade in this tight of a range near all-time highs is extremely rare and we probably have the election to thank for it, as big money would rather wait until the results before making any moves. From a technical viewpoint, neither the bulls nor the bears have been able to muster sufficient strength to break this market out of the narrow range. For both sides, they might have well been the characters Vladimir and Estragon in a production of Waiting for Godot. Nevertheless, there are plenty of reasons to be bullish on equities on an intermediate term basis. As the American elections approach their final denouement in two weeks, it's time to look ahead to a number of political dark clouds forming in Europe. 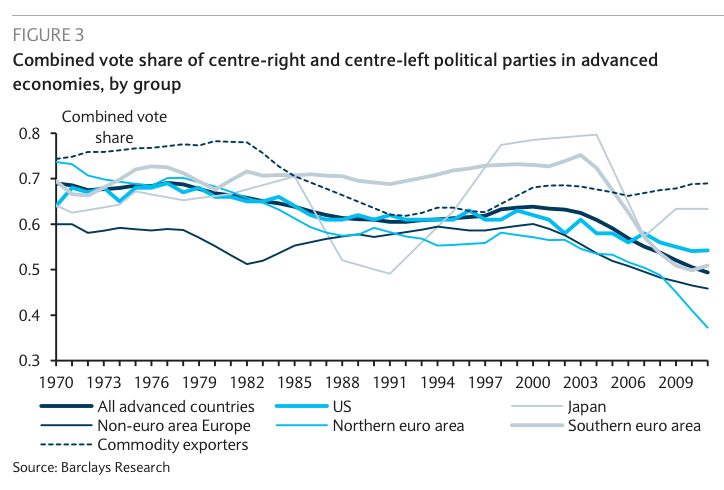 FT Alphaville recently highlighted research from Barclay's showing the collapse in support of establishment parties around the world. The support for anti-establishment and protest parties and candidates have been on the rise - and these individuals represent threats to upset the current political status quo. After the US election in November, we have to look forward to the Italian referendum on December 4, the start of Brexit negotiations in early/mid 2017, the French election, and the German election. All of these events have the potential to tear Europe apart. 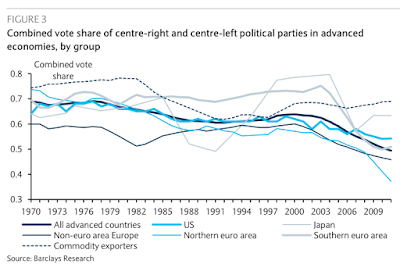 I believe that fears over the political disintegration in Europe may be overblown. Arguably, we could be seeing a near-term peak in the support of the protest vote in 2016 and 2017. When does the Fed remove the punch bowl? How will the Fed fight the next war? In my last post (see A sentimental embrace of risk), I showed that risk appetite was starting to perk up. Investor interest is rising in both the reflation and cyclical investment themes. So far, this risk-on thesis is showing solid fundamental underpinnings. The bearish strategists at Goldman Sachs and HSBC who had forecasted a disappointing Q3 earnings season have so far been wrong (see Q3 earnings season: Stud or dud?). With 23% of SPX companies having reported earnings, John Butters of Factset observed that both the EPS and sales beat are well above their 5-year historical averages. 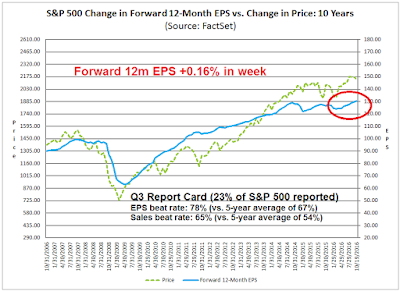 As a result, Street optimism continues to improve as forward 12-month EPS rose another 0.16% in the week (chart annotations are mine). The stock market is on pace to rally on the back of a growth revival and the end of the earnings recession that began in late 2014. This party is just starting to going. The only question is when the Fed will act to take away the punch bowl. This issue is becoming a crucial question for investors, as speeches from Yellen and Fischer last week may indicate that the Fed is signaling the start of a shift in thinking of how it fights the next war, persistent low growth. Hedge funds, as measured by option data and the CFTC futures Commitment of Traders data, though hedge funds are partly represented in the BAML FMS sample. Each group is different and they can behave differently. The first three tend to represent slow but big money, while hedge funds represent the fast and high turnover money. The differing groups of institutions don't always agree. Today, however, the US and global institutions all seem to have formed similar views. Institutional investors are bearish on bonds and they are becoming increasingly bullish on stocks, based on a belief that growth is improving. Under these circumstances, the key question for traders and investors is whether they should jump on bullish equity bandwagon or be contrarian and fade the institutional purchases. 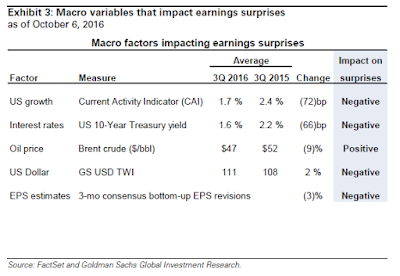 Q3 earnings season: Stud or a dud? Regular readers will know that I have been bullish on stocks for the last few months. My forecast has called for an equity rally into year-end and beyond. Last week, a couple of Street strategists have turned cautious on the stock market. I would therefore like to examine the bear cases that they present. Bloomberg reported that Goldman Sachs strategist David Kostin set an SPX year-end target of 2100. The main reason for the bearish call is earnings disappointment. "Variables that determine earnings surprises – changes in U.S. economic growth, interest rates, oil price, the dollar, and EPS [earnings per share] revisions – suggest a below-average share of firms will report positive earnings per share surprises (43 percent vs. 46 percent)," he writes in a note to clients. " We see a weak third-quarter reporting season coupled with negative fourth-quarter EPS revisions pushing stocks 2 percent lower to our year-end target of 2,100." "We think markets are pretty vulnerable. You have earnings expectations which are pretty high, you have valuations which are pretty high," he said. "You look around the world, the level of economic-policy uncertainty is very, very high — I think that is a dangerous combination right now." As I will show, at the core is the bull vs. bear debate is whether the earnings recession ended in Q3 2016. A scary analog has been floating around in the last few days. 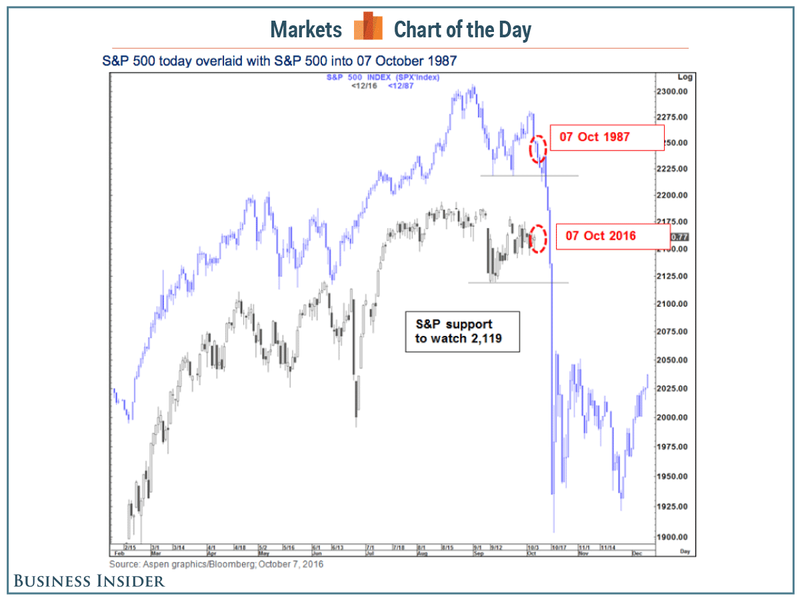 Citibank FX analyst Tom Fitzpatrick postulated that the current market looks an awful lot like 1987 (via Business Insider). Murray Gunn at HSBC also issued a similar crash warning. Oh, puh-leez! 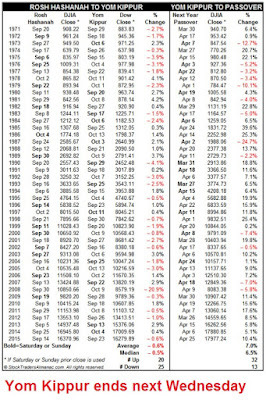 I can think of at least three reasons why this isn't 1987 (also recall The USD Apocalypse of September 30, 2016). 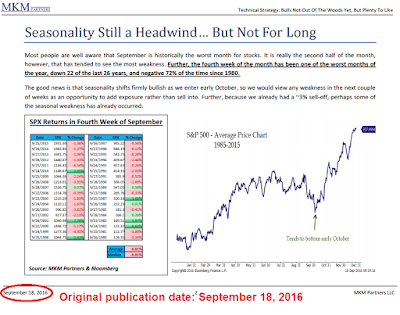 Mid-week market update: I wrote on the weekend to buy Yom Kippur, which ends today (see Buy Yom Kippur! SPX 2500 by Passover?). My inner trader sent out an email to subscribers yesterday indicating that he had added to his long position by buying a high-beta small cap position. Recently, Jonathan Krinsky of MKM Partners highlighted a bullish seasonal pattern with a likely market bottom in early October (chart via Marketwatch, annotations in red are mine). 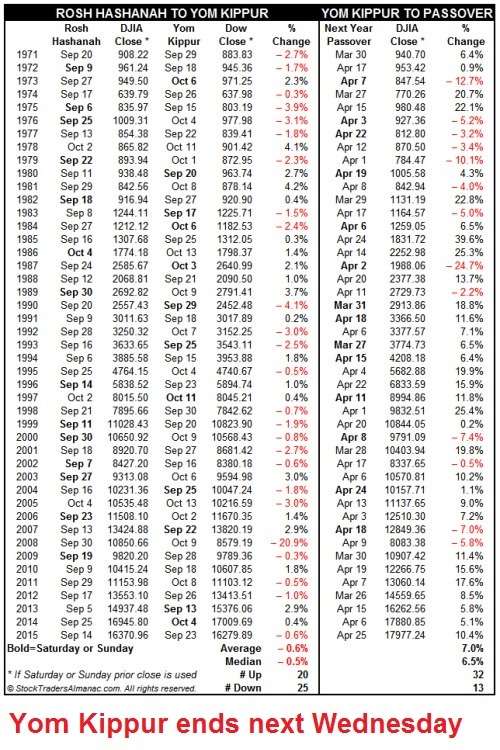 Jeff Hirsch also documented the trading results from the trader's adage of "Sell Rosh Hashanah, buy Yom Kippur", as well as the returns from Yom Kippur to Passover, which occurs in the spring. Normally, I don`t give a lot of weight to seasonal patterns in my investing and trading, but it appears that macro-economic, fundamental, and technical factors are all lining up for the positive seasonal pattern for the remainder of the year. With that preface, what the likely result for the September NFP, especially in light of the miss in ADP's private employment report? Will September NFP come in above or below the 175K estimate? Mid-week market update: The market gods must be angry. Just as a goldbug predicted the demise of the US Dollar (and therefore the rise of gold) as of September 30, 2016 at 4pm ET, the USD rallied and gold cratered on Tuesday. The technical damage to gold was extensive, as it broke a key support level at 1300, though it did stabilize today. I have had a number of questions about the outlook for gold in the past. My reply has always been the same. Don`t ask me about gold, ask about the US Dollar. 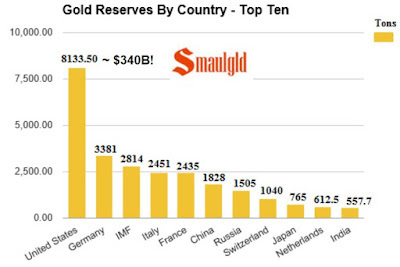 Consider this chart of stated gold reserves. Assuming that the conspiracy theorists are wrong and the United States has all the gold it says it has, the market value of US gold reserves at $1300 per oz comes to roughly $340 billion. That`s not even a single year`s fiscal deficit! The global holdings of US Treasury paper dwarfs precious metal holdings. From a portfolio viewpoint, gold cannot be anything but a miniscule weight in the aggregate holdings of a global portfolio. As the gold price is inversely correlated to the greenback, it makes sense to analyze the more liquid asset class, namely the USD. Dangerous over-valuation, or a New Era? 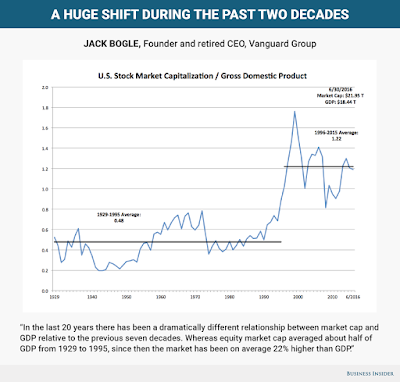 Business Insider recently featured a chart from Vanguard Group founder Jack Bogle, who observed that the market cap to GDP ratio has become highly elevated to its own history starting about 1996. 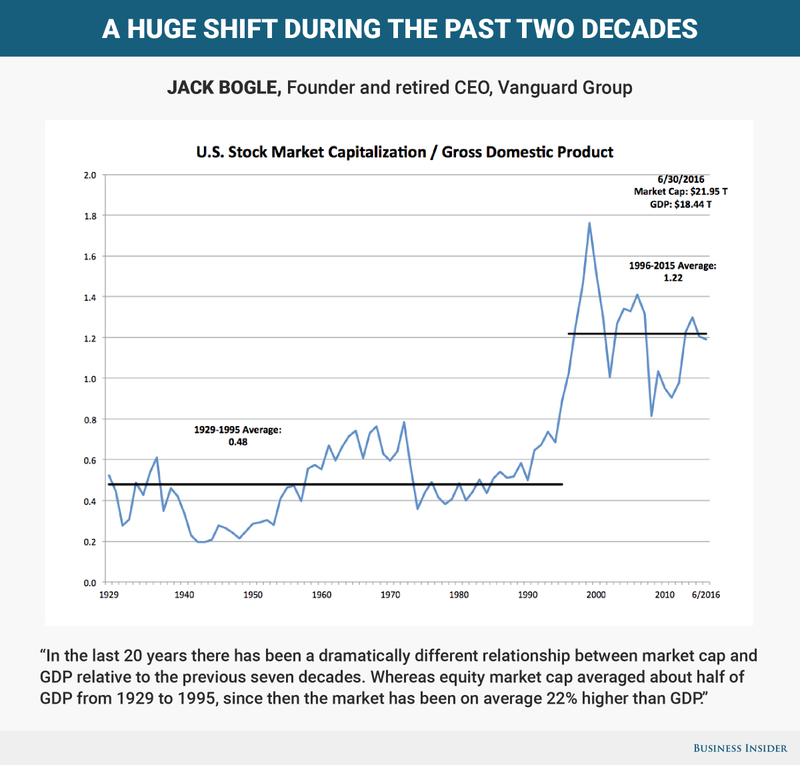 You might recall that the market cap to GDP ratio was also said to be one of Warren Buffett's favorite equity market valuation metrics, though he has been silent on the issue for a number of years. What's going on? Has the stock market become dangerously overvalued, or is this a New Era? If Deutsche = Lehman, then Greek banks = ? Readers of a certain age will recall the immortal line of late Gilda Radner as "Rosanna Rosanna Dana" in Saturday Night Live, "It's always something!" Two weeks ago, the market was worried about the uncertainties posed by presidential debate. Last week, it was Deutsche Bank. This week, my market commentary will focus mainly on a tail-risk scenario of a Deutsche Bank sparking a European banking crisis. To recap, the markets got spooked by continuing concerns over the financial health of Deutsche Bank (DB). 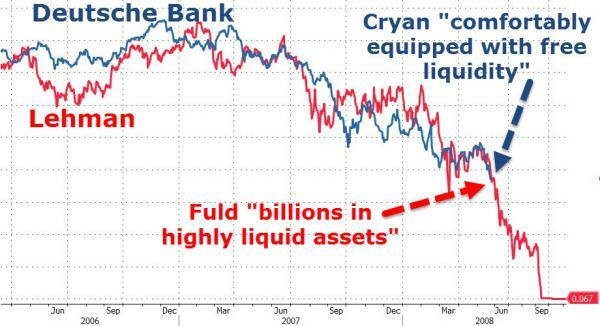 The worries sparked a number of comparisons with the failure of Lehman Brothers, which sparked the Great Financial Crisis of 2008 (chart via Zero Hedge). If you are still worried about DB, then consider the following: If Europe didn't allow the Greek banks to topple during the last couple of Greek financial crises, would it allow a systemically important bank like DB to fail? If you accept the Deutsche as Lehman analogy, then what would that make Greek banks?